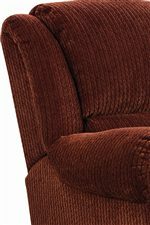 The Recliner will provide you hours of complete comfort. 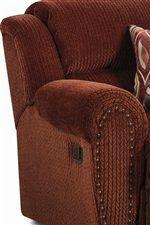 Available in fabric or leather, this nailhead trim recliner will create a relaxing place after a crazy and hectic day. The exterior large reclining handle will allow you to effortlessly kick up your feet. The soft heavy padded footrest will give your feet complete support. The wallsaver feature allows you to fully recline within close proximity to the wall, so you can make the most of your space. The Summerlin Wall Saver® Recliner with Nail Head Trim Accents by Lane at AHFA in the area. Product availability may vary. Contact us for the most current availability on this product. Arm Rolled plush arms with nail head trim create a traditional style.